Malcolm Yadack is responsible for innovation management at the municipal utility of the city of Tübingen in Baden-Wurttemberg. 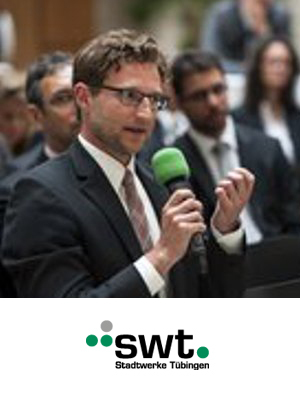 He has worked in the German electricity sector for 8 years, having originally focused on flexibility markets and regulatory policy. He now coordinates and supports industrial, interdisciplinary projects in the areas of storage, smart metering and demand response. He advises working groups for the VKU and at the EU level in the areas of flexibility markets, on digitization of the energy system and on innovation implementation in the business environment. He participates in an active or advisory role in multiple public research and demonstration projects in the areas of flexibility markets, blockchain applications in the energy economy and demand response. He works closely with the University of Applied Sciences in Stuttgart through the scientific coordination of the international demonstration project for demand response in blocks of buildings, “Sim4Blocks”.